The 2018 Web Summit, held from November 5—8, is expected to draw 70,000 attendees from 170 countries, 1,800 start-ups and 1,500 investors. [needs update] The speakers of 1,200 talks include Twitter co-founder and Medium CEO Evan Williams, Tim Berners-Lee, European Commissioner for Competition Margrethe Vestager, President & Chief strategy officer at Samsung Electronics Young Sohn, Lisa Jackson as environmental director of Apple, Secretary-General of the United Nations António Guterres, Chief Brand Officer of WWE Stephanie McMahon, Pinterest CEO and Co-Founder Ben Silbermann, president and chief legal officer of Microsoft Brad Smith, Twitch CEO Emmett Shear, former British Prime Minister Tony Blair, CTO and co-founder of Slack Cal Henderson, Booking.com CEO Gillian Tans, Shell CEO Ben van Beurden, Oculus Founder Palmer Luckey, TripAdvisor CEO Stephen Kaufer, Sophia The Robot, Major Lazer DJ Jillionaire (Christopher Leacock) and the 2016 Formula 1 World Champion Nico Rosberg. Madonna ended her Re-Invention Tour with two sold-out shows for 33,460 fans on September 2004. 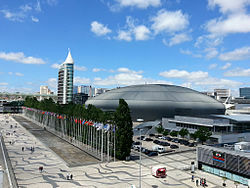 It was the first time that Madonna performed in Portugal. Justin Bieber performed a sold-out show at the venue on 11 March 2013, as part of Believe Tour. Beyoncé performed two consecutive sold-out shows in 2014, on March 26 and 27, as part of The Mrs. Carter Show World Tour. Shakira holds the record for the biggest attendance with her Oral Fixation Tour back in 2007 with a completely sold-out show. Adele performed two consecutive sold-out shows in 2016, on May 21 and 22, as part of Adele Live 2016. ^ "Web Summit | Lisbon | Speakers - The biggest names in tech | Web Summit | November 5–8". Web Summit. Retrieved November 6, 2018.